Perhaps an upcoming feature on the next version of the iPhone or iPad, Apple filed a patent over a year ago with the United States Patent and Trademark Office that outlines a method of face recognition for taking an iOS device out of sleep mode. 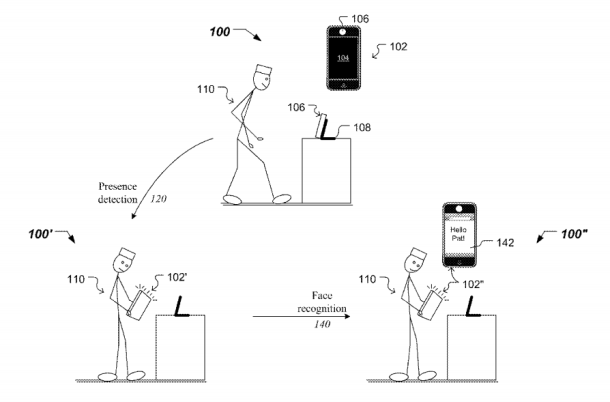 Likely built into a future version of iOS, an iPhone, iPod Touch or iPad would recognize that a user is in the vicinity after the user picks up the device and utilize the camera to scan the user’s face to turn on the device automatically. While security would be a concern to anyone that currently uses a password to lock their iOS device, Apple mentions that the software would isolate unique facial features in addition to specific skin tones to recognize a face. The software would memorize the attributes to the face, but the user may potentially have to reset the scan after any form of facial plastic surgery or something as simple as a sunburn. Apple is already utilizing face detection in the iPhone 4S for photography. The camera automatically detects up to 10 faces within the picture and sets the focus on the most prominent face. It’s likely that the current face detection software will be customized to work with facial recognition elements. Apple calls the new technology “low threshold face recognition” and is designed to work in many situations where lighting can be an issue. Facial recognition technology already exists on Google Android phones with the recent release of the Galaxy Nexus smartphone. While the feature is definitely interesting, users were quickly able to fool the software into unlocking the phone after scanning a picture of the user’s face. Google warns users that facial recognition offers lower security that using a pin or other password to lock the Android device. Apple filed this patent 18 months ago and hasn’t issued any official comment on how this technology will be utilized in future devices. Any announcement concerning the use of facial recognition on iOS devices will likely come at the next Apple press conference.